The final was played at Rockliffe Hall GC in County Durham on August 28, 29, 30th between Cornwall, Kent, Lincolnshire and Yorkshire. The weather at the beginning of the week for practice was dreadful with heavy showers, but as the week progressed only a few light showers with a moderate breeze, some sunshine, but cool at times! The first day saw us play Kent, a very strong side on paper! We didn’t get off to the best of starts in the foursomes, with Jack Leversidge & Charlie Daughtry 3 down after 4 holes against their best player Jenson Hull & Ben Quinney. They fought back with some sparkling golf to have the game all square after 9 holes. A fantastic display over the closing holes saw them take out the Kent duo 2&1. 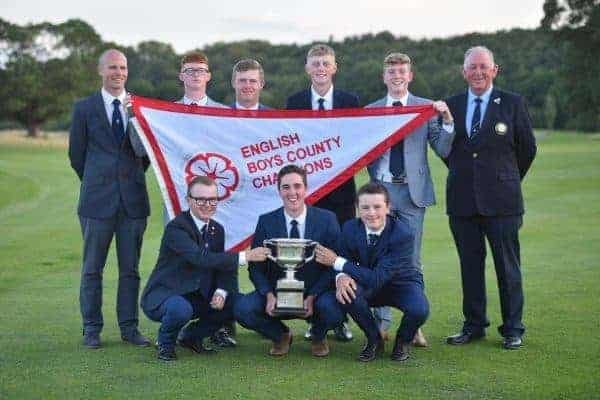 Our second pairing of Boys Captain Callum Macfie & Jack Maxey also had a tough game with the score never been more than 1 up to us most of the way round until the 18th hole where we lost 1 Down. Final pairing of Ben Schmidt, winner of the Lee Westwood Trophy and Josh Berry, French U14 Champion battling back from 2 down after 6 holes to all square with three to play, winning 16 & 17 holes for a great victory 2&1. Once again, we did not get off to the best of starts, with only two games being up! Jack Maxey was out first against Jenson Hull, their top player and was 3 down after 10 holes, but with a tremendous run of birdies was 1 up after 14 holes, loosing 15 then bouncing back winning 16, halve on 17th then a win at 18 to claim the game 2 up, great win Jack! Ben Schmidt had an easy game winning 7&5. Jack Leversidge struggled with his game loosing 4&2. Charlie Daughtry was in his usual fighting mood and playing some exceptional golf to see off his opponent 5&3. Michael Hay struggled against George Young and unfortunately never up to lose 2&1. Josh Berry, replacing Callum with a slight back injury from the morning round played his usual high standard of golf having been down for the first nine holes to come back in the back nine to win 2&1. The second day saw us take on Cornwall, the first day losers! We got off to a better start being up in all three games, however a fight back from their No 2 pairing of Joe Reynard & George Leigh, their best player against Michael Hay & Jack Leversidge saw us lose the game 3&2. Jack Maxey & Charlie Daughtry were out first and were 3 up with 3 holes to play, losing 16 & 17, but managing a halve on the last with pars to win 1up. Ben & Josh played some good golf for most of the round, struggling with the last couple of holes, losing both for a halved game. Jack Maxey went out first again, playing George Leigh, their strongest player, also an England player who is joining Ben Schmidt in Italy this coming week. Jack was 1 up early door’s, all square by 7, then a birdie for George took him to 1 up at 8. Jack birdied the par 5 13th to square the game then a flurry of good golf produced wins at 14, 15 and finally at 16 to take the game 3&2, tremendous effort! Ben had another comfortable win over Joe Reynard winning 6&5. Charlie had a bad run in the middle of his round to lose 6&4. Michael was back on form today, 4 up after 9 holes to close out his opponent George Law 5&4. Jack Leversidge was never down in his match and with a slight scare towards the end loosing 17 to be 1 up going up 18, he kept his cool and half secured a 1up victory. Finally, Captain Callum recovered from his slight back injury played some solid golf to win his match easily 4&2. Our final day saw us meet Lincolnshire to decide who would be County champions! Weather wise the day was the best of the week, sunshine, warm and a slight breeze. Callum and Jack Maxey were out first in the foursomes playing their top man Hugo Kedzlie and Michael Baines, they were 2 up after 6 holes, so off to a good start! At the turn Lincolnshire had managed to pull the game back to all square and then with a run of birdies took it to 3 up after 13. Jack & Callum managed to pull a few holes back again with birdies at 14 & 17 to go up 18 1 down. Both teams played excellent shots into 18 with Jack about 8 foot away and the opposition about 13 foot away sadly for us, Michael Baines aged 13 holing his putt to win the game 2Up. From the second hole Charlie & Michael were in command of their game and never looked back to win 3&1. Ben & Josh had a tussle against the pairing of Jake Craddock & Olly Mitchell with both Ben & Josh peppering the pins, but sadly no putts dropping! Birdies at 15 and 16 for Ben & Josh put them in the lead at 2 up with a par on the 17th giving them the game 2&1. Jack Leversidge brought our first point home in the afternoon with a convincing win over Olly Mitchell 7&6. Jack Maxey out first in the afternoon, a place he was becoming to enjoy, started well and was 2 up after 9 holes, this is how it remained until 14 where he went 3 up to win 3&2. Another point secured with only a half point needed to win the Championship, this was accredited to Charlie dormie 2 after winning 16 with a par, continuing to win on 17 2&1. Michael had a tight front nine, but after the turn came out of the starting blocks to win 2&1. Both Josh and Ben played some great golf in challenging games to halve both theirs. Once again victory was ours!